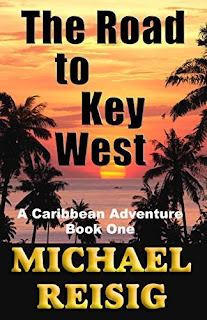 By the the best-selling author, Michael Reisig, The Road to Key West is an adventurous/humorous sojourn that cavorts its way through the 1970s Caribbean, from Key West and the Bahamas, to Cuba and Central America. In August of 1971, Kansas Stamps and Will Bell set out to become nothing more than commercial divers in the Florida Keys, but adventure, or misadventure, seems to dog them at every turn. They encounter a parade of bizarre characters, from part-time pirates and heartless larcenists, to Voodoo bokors, a wacky Jamaican soothsayer, and a handful of drug smugglers. So pour yourself a margarita and slide into the ‘70s for a while, as you follow Kansas and Will through this cocktail of madcap adventures – on The Road To Key West!